Baram Zitkala was the son of the most famous king in Awan history. Since his older brother became heir to the throne, Baram focused on religious studies and became an influential teacher. When he was young, he and his friend, Herschel Zalman, toured Awan to learn the folk history of the different tribes. This is when he met an Asa healer, Tanese Vogel. The two married and settled in the city of Zohar in Uriyana, where Baram and Herschel founded Maheertsa, a school for students with exceptional gifts and learning disabilities. Now Tanese enjoyed cooking. When she moved to Uriyana, a tribal land far to the north of her subtropical homeland, she found herself needing to use different ingredients; ingredients like cranberries, hazelnuts, and cider vinegar. However, Tanese refused to give up Asa ingredients entirely. When she made her version of cranberry compote for this tart, she added ginger, orange juice and orange liqueur (Grand Marnier). After piping the cross-hatch pattern on top of the tart, she decided it needed a little something extra, so she sprinkled it with almonds from Asanya. The recipe for the cranberry compote was created in the Pasternack home kitchen, and the recipe for the hazelnut tart is my gluten-free adaptation of a Nick Malgieri recipe for linzer torte. But I think the story about Tanese Zitkala is more fun. 1. Combine cranberries, brown sugar, orange juice, ginger and cider vinegar in a sauce pan. Bring to a boil and then turn down to a simmer for about fifteen minutes. 2. Stir in Grand Marnier and salt. Remove from heat. 1. Combine gluten free all-purpose flour, xanthan gum, ground hazelnuts, baking powder, sugar, and spices in a mixing bowl. 2. With an electric stand mixer on the first speed, blend the butter into the hazelnut mixture using the paddle attachment (if you don’t have a stand mixer this can be done by hand by rubbing the butter into the hazelnut mixture until it has the consistency of coarse sand). 3. Beat one egg and one yolk and then mix into the hazelnut mixture until dough clumps together. Keep at room temperature so the dough remains very soft. 4. Grease a ten inch tart pan with removable bottom or a pan lined with a greased parchment paper disk. 5. Add half of the hazelnut dough to the pan and spread out the dough to cover the bottom of the pan. Press until flat. 6. Spoon the cranberry compote into the middle of the pan. With an off-set spatula, spread the compote into a circle approximately one inch (or a little less) away from the edge of the pan. 7. Place a 1/4 inch tip into a pastry bag and fill the pastry bag with the second half of the dough. Pipe a cross-hatch lattice over the compote. Pipe drops around the circumference of the tart, just around the circle of compote. 8. Beat one egg and gently paint over the exposed dough. 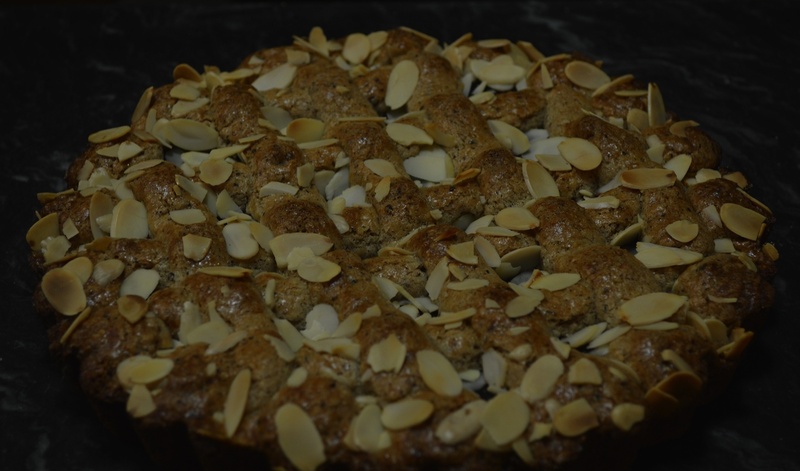 Sprinkle sliced almonds over tart. 9. Bake approximately 45 minutes. Damn, that torte was good.